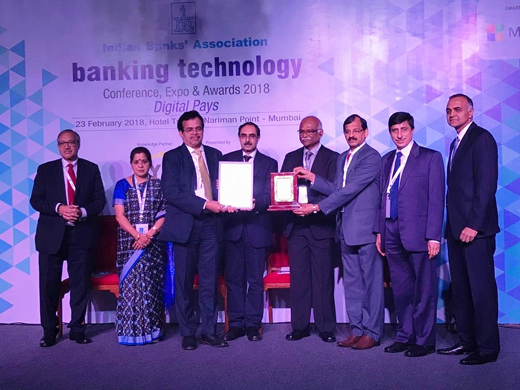 Mangaluru, Feb 26, 2018: Shri Raghavendra Bhat M, Chief General Manager and Shri Mahalingeshwara K, General Manager, receiving the awards from Shri Ajay Prakash Sawhney, IAS, Secretary, Ministry of Electronics & Information Technology, Government of India and Shri R Gandhi, Former Deputy Governor, RBI, in the IBA Banking Technology award function held on 23-02-2018 at Mumbai. [a] Runner up – Technology Bank of the Year. [b] Runner up – Best use of Digital and Channels Technology. [c] Runner up – Best Payment Initiatives. Seen on the occasion are Shri Ravishankar N R, DGM and others.